B0773. BRIAN RUST. The Victor Master Book, Vol. II (Vol. I never published), 1925-36. England, Published by the Author, 1969 (Orig. Edition). 776pp. Includes listings of Personalities & Performers, alphabetical by Artist offering specific recording locations & dates, including all rejected “takes.” Invaluable reference source for black Orthophonic Victors, arranged by matrix number, with cross references by issue numbers. Volume 1 was never published, so this was 'it'. Long out-of-print, Final Copy! “The term ‘mouldy fig’, used by modernists about jazz fans who prefer older forms, was a badge Rust wore with pride. 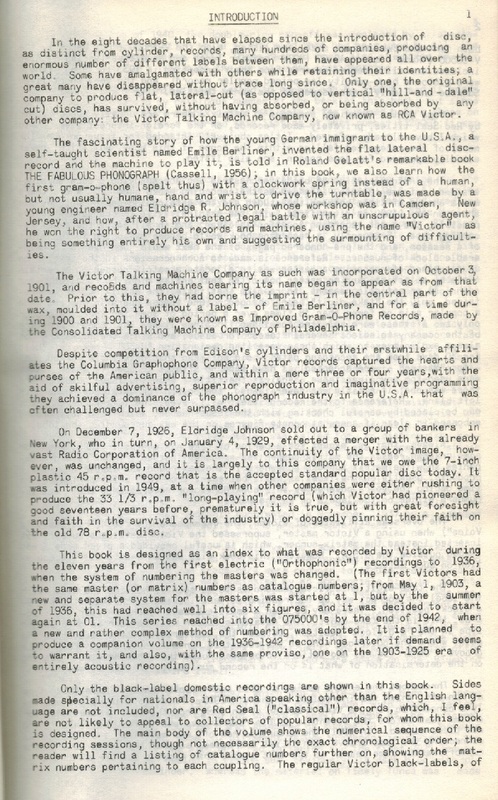 He had a special affection for Victor records, which he part-documented in THE VICTOR MASTER BOOK (1969). 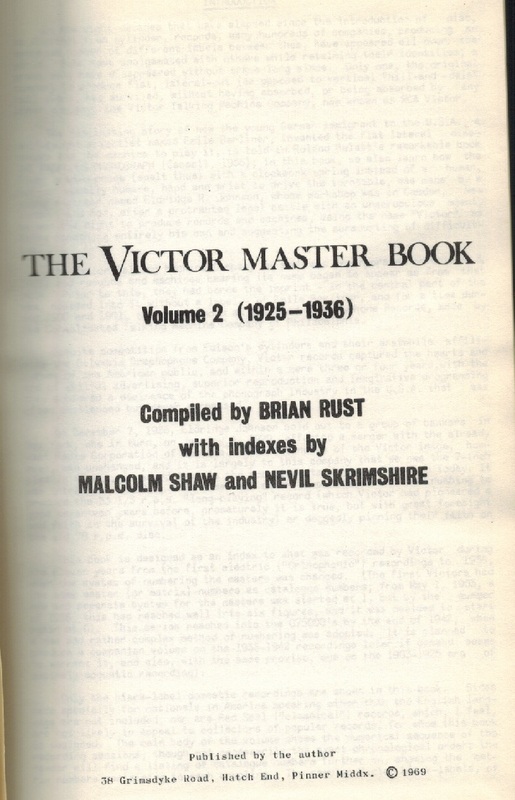 "Here is Brian Rust's self-published discography, 'THE VICTOR MASTER BOOK, Volume 2 (1925-1936)'. Indices by Malcolm Shaw and Nevil Skrimshire. Second printing, 1970 by Walter C. Allen. Volume 1 was never published, so this was 'it'. The discography covers primarily black label popular recordings (no Red Seals), with many selections by Billy Murray, Nat Shilkret, Paul Whiteman, Jean Goldkette, Vernon Dalhart, George Olsen, Fats Waller, lots of jazz, country, etc." ‘Discography is a road map to the recorded past’, said Tim Brooks, who collaborated with Mr. Rust on THE COLUMBIA MASTER BOOK DISCOGRAPHY, a four-volume work published in 1999. ‘Virtually any historical jazz reissue goes back first to Rust to find out what to look for — what recordings an artist made, how many versions of each that artist made and where they might have been issued, so you can get your hands on it. And he would trace all of that’. ‘All of that’ is now standard information in discographies across musical genres, and it is to Mr. Rust, colleagues say, that such comprehensiveness is owed. ‘Jazz research at its beginnings was the purview of dedicated amateurs’, Bill Kirchner, a jazz musician and historian, said in an interview. There was no precedent to dictate what the nature of it was going to be, and what the details were going to be. And he was really one of those people who decided, ‘This is what it should encompass’.